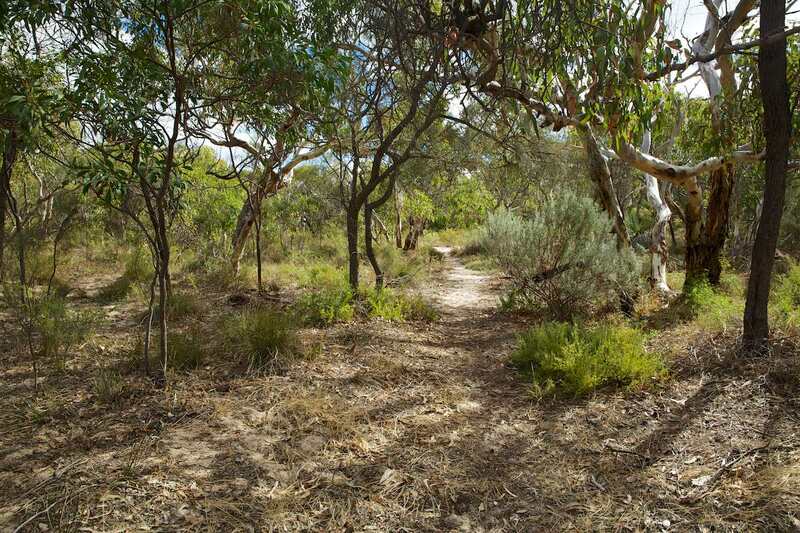 The Aldinga Scrub Conservation Park contains a number of well maintained sandy walking trails which wind their way through the various plant communities to be found throughout the Scrub. The best time to visit the park is a matter of opinion; however, most people would prefer walking in the Scrub from mid autumn to late spring. The very hot mid-summer period is a time to avoid. Dogs, bicycles and camping are not permitted. Wear sand shoes or light boots and a shady hat and don't forget to take water if you plan to be out for long; there is no water or other facility available in the Park. The Aldinga Scrub is a delicate environment and you are requested to remain on the marked trail at all times to avoid damage to vegetation and minimise erosion. Most of the trails throughout the Park interconnect so it is almost always possible to complete a circuit without retracing your steps. Allow a couple of hours to explore and enjoy our Park. There are a number of entry points to the Park. Possibly the best for beginners is at the Dover Street car park on the corner of Dover and Fraser Streets in Aldinga Beach. This is the starting point for three trails including our self guided walk, the Coral Lichen Circuit. If you are travelling from Adelaide, proceed along South Road until you reach the Aldinga Beach Road turnoff 1 km past the township of Aldinga. Travel along Aldinga Beach Rd for about 2.5 km until you reach Dover Street on the left. Turn into Dover Street and after 1.5 km you will reach the car park. The entrance to the Park is on the southern boundary of the car park. Other entry points are at the corner of Quondong Avenue and Acacia Terrce, Wattle Street and Acacia Terrace, at the Aldinga Beach Holiday Park (end of Cox Road), and the intersection of Boomerang Avenue and Acacia Terrace. A feature of the Park is the Acacia Terrace wetland site. This is well worth a visit and is on the Park boundary just south of the Boomerang Avenue/Acacia Terrace intersection. Please exercise care and avoid coming too close to the pond if you decide to enter the wetland itself.